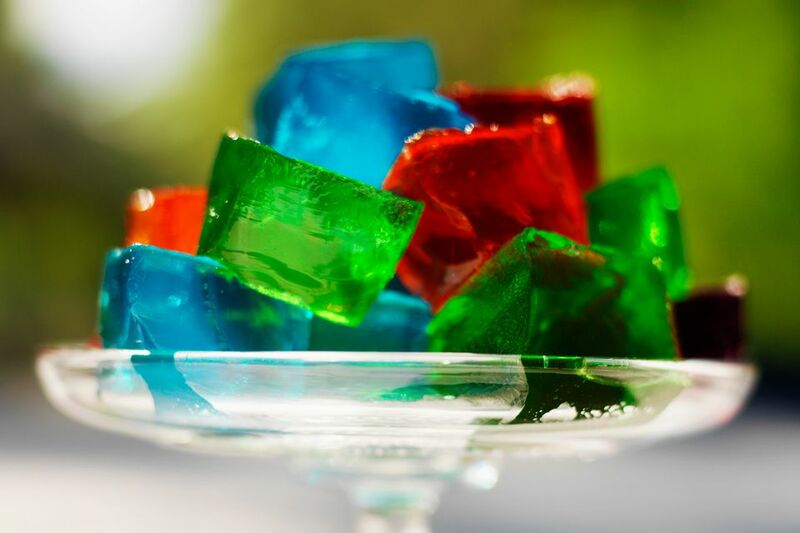 Agar-agar or just agar in culinary circles is a vegetarian gelatin substitute produced from seaweed. The jelly-like substance, which comes from red algae, is made up of particles found in galactose, a blood sugar like glucose and fructose that is foundational for sustaining animal life. Also known as China grass and Japanese kanten, the white and semi-translucent vegetable gelatin contains a few calories and is an excellent source of a calcium, iron, and fiber. It is sold in Asian and health food stores in both flake, powder, and bar varieties, and can be used in several dairy-free and vegan recipes as a stabilizing and thickening agent for custards, puddings, sauces, and even vegetarian marshmallows. Seaweed is typically boiled into a gel, pressed, dried, and then crushed to form agar flakes. Agar flakes can be used as a thickener and quickly dissolves after it is boiled or cooked. Remember to fully dissolve agar in hot water before using it. You do not want it to start solidifying in a recipe mixture. To use agar flakes in a recipe, traditional instructions typically call for one tablespoon of agar flakes to every cup of water or juice though measurements may vary from recipe to recipe. Like animal-based gelatin, agar is dissolved in a liquid in a small saucepan over medium-high heat, brought to a boil, and then simmered until slightly thickened for about five to seven minutes. Then, it's chilled in the refrigerator until set and eaten cold. Consider making an easy recipe, like vegan chocolate pudding, if it's your first time cooking with agar. Agar powder can be used to make delicious puddings and jellies, like a cherry blossom milk pudding, coffee jelly, or the classic anmitsu Japanese dish. Anmitsu is a traditional summer dessert that has agar jelly cubes, azuki bean paste, mochi, various fruits, ice cream, and peas. These different flavors and textures create a harmonious taste and can be made in less than 30 minutes. Agar is often used as a laxative since it contains 80 percent fiber and moves through your digestive system fast. This plant-based food doesn't have a true taste or smell but firms up in recipes, unlike animal gelatin, which has more of a creamy consistency. In eastern traditional medicine, agar has been used to treat illnesses like diabetes and constipation. It also makes people feel full due to its bulking effect and can act as an appetite suppressant. Rich in minerals, agar is full of essential nutritional value like potassium, magnesium, and folate. There are no sugar, fat, or carbohydrates in agar, making it an aid to weight loss. In fact, it's often used as the main ingredient in the Kanten Diet, which is a popular weight loss plan in Japan. The Kanten Diet often includes agar as a thickener in soup or as a dessert. People also eat snacks like mizu yokan, which is made out of a red bean paste or tea powder.